Neighboring the majestic Burj Khalifa, Address Boulevard hotel stands tall in one of the most bustling section of Dubai. 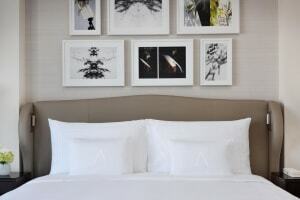 As an iconic hotel of the Emaar Group, Address Boulevard offers its guests a unique hotel experience with its 200 minimalist styled chic havens imbursed with latest technologies. With three swimming pool, a lavish spa and fitness center as well as a spacious and lofty lounge area, guests are provided with various recreational options to make their stay more comfortable and enjoyable. Savor an array of cuisines from around the world at The Restaurant that takes you on a heavenly gourmet journey. A library, music room, and outdoor games are also available to keep the guests entertained. 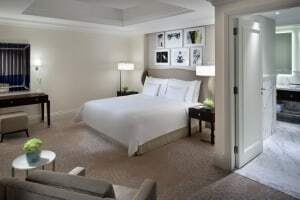 All the rooms and suite of the hotel are equipped with automated in-room iPad service. Minimalist styled rooms with state-of-the-art technology. Devised more like an apartment than a restaurant, this unique restaurant has something for everyone. With its 'home-away-from-home' concept, you'll find a brilliant blend of comfort and luxury altogether. The Restaurant has dining spaces for every occasion. Communal dining spaces and an outdoor terrace for family and friends or a private Dining Room for the special event, the Restaurant takes you on an incredible culinary voyage with its avid experiences. 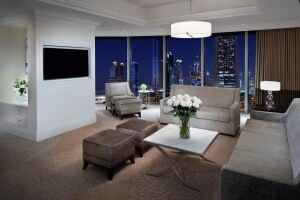 Classy and chic, the Lounge at Address Boulevard is bestowed with astounding views of the one and only Burj Khalifa. A cozy place to hang out and enjoy together with your friends and family, the high ceiling and glass wall makes gives it more space and add to its appeal. Indulge in a wide array of light beverages, mocktails, sweet and savory treats while enjoying the magnificent views of Dubai skyline. Enter to the serene zone of pure relaxation and tranquility, the Spa at Address Boulevard is a full package of pleasure. Elevate your sensory experience with the thoughtfully curated treatments that help in maintaining balance among the elements of your body and leave you as fresh as a daisy. The spa is fully equipped with ten treatment rooms for him and her, a spa suite, steam rooms, Finnish saunas, relaxation lounge, a vitality pool, as well as beauty lounge. Kindly arrive at least 25 minutes prior to your scheduled time. For guests who wish to keep up with their fitness routine during holidays, Address Boulevard has a fully equipped modern fitness center with professional training programs. Outfitted with the latest machines and weights, the Fitness Center is a perfect place to let off some steam and maintain that fabulous shape. Kindly carry gym accessories and a bottle of water with you for a hassle-free experience.